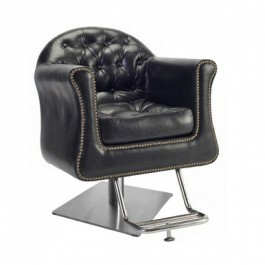 AYC K1173 Presidential Salon Chair - Features a large seating area with plush vinyl cushioning for additional comfort. This upholstered chair is finely detailed with tufted buttons. The front of chair is trimmed with hand applied individual antique-style brass nail heads. The U-shaped extra wide chrome footrest is removable. The presidential styling chair only comes in black.